If you missed my earlier article How Long Do Hard Drives Last?, I encourage you to read that first, to learn about hard drive life expectancy and why I think that's really the wrong question to be asking. That said, let's continue to the question at hand: hard drive longevity. A disk checking utility called CHKDSK comes with Windows, and it's pretty good at detecting bad files and physically damaged sectors. It will lock damaged sectors so that the computer will not attempt to write to them. To run CHKDSK, first open the "Computer" window. Right-click on the icon for the hard drive you want to check, and select Properties. On the "Tools" tab, click the "Check Now" button under Error-checking. I'll also repeat my bottom line advice from that article: Most of the time, hard drive failures happen at unpredictable and inconvenient times. So backing up your data regularly is vital, and is your best defense against loss of data. My ebook Everything You Need to Know About BACKUPS will get you started, if you're not doing backups already. Most recent comments on "[HARD DRIVES] Is Yours SMART Enough?" Where is the "computer" window of which you speak, to locate CHKDSK? Does this count for SSDs too? Speccy says all is well, but being SSDs, it may be that they'll fail without warning? Stephe: Yup, S.M.A.R.T applies to SSDs also. Anecdotally, SSDs fail with no warning suddenly more often HDDs and data recovery by experts is harder from SSDs. A read-only pass on both SDDs and HDDs does seem to increase reliability, forcing the drive to read every sector. If there are recoverable errors, the drive fixes the problem itself; that's what the spare sectors are for. Spinrite (though it doesn't run on many new computers) and the afor mentioned CHKDSK /R will do a full read pass on either HDDs or SDDs. @David Cameron: The computer window is Command Prompt (Start-->CMD). In the command prompt window you type in chkdsk then hit return. If you have multiple disks, enter in the drive letter. This has been there from the early days of DOS. 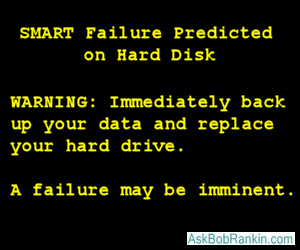 All drives, no matter what kind or age, can suddenly, irrecoverably fail with no warning so, as Bob has repeatedly pointed out, backups are essential! I rarely check the S.M.A.R.T. attributes on my drives because even a drive that shows good attributes can fail tomorrow and one that the attributes suggest the drive is on its last legs may last for years. Instead, I just keep my drives backed up to the teeth so I don't need to worry about them. The only reason I retire drives is I outgrow their capacity or they die (the latter being rare). The one exception was when I bit the bullet and replaced all my HDDs with SSDs. SSDs usually fail irrecoverably, often without warning, but they are less likely to fail than HDDs. Again, it's not worth worrying about as long as you have adequate, up to date backups. I've had only one SSD (out of over 30) fail in service (it was my first one, a 128GB Sammy that was pushing five years of 24/7 operation. It took me only an hour for me to replace the drive with a 500GB SSD I had outgrown and restore the backup to it. The only reason it took that long was it was located in a difficult to reach location and I had to remove other parts to get to it. I keep at least one spare for each size and model of SSD I use so I don't have to scramble to get a replacement should one ever die on me before I retire it. SMART tends to be useless when it comes to SSDs. And worse yet most of my SSD failures tend to be catastrophic, In my experience you are best off with vertically manufactured SSDs, where the same manufacturer does the flash , controller and software. I like Samsung, Intel and Crucial/Micron in that order. Others, not so much. Do NOT download the file extension Transit as it gave my computer 36 PUPS as found by Malware Bytes. I use Piriform's excellent Speccy. Its current version (1.32) still has the bug that I reported to them over a year ago: if you connect an external hard drive via USB, Speccy reports its SMART data as an exact copy of the first internal hard drive of your PC. A potentially serious bug, especially if you are diagnosing a disk from another PC. I hadn't heard of Argus Monitor but there are two interesting things in Argus' licensing that you didn't mention. Firstly, you can get a 30-day free trial of it. Secondly, if you buy a 2-PC licence for $8.50, you are entitled to use that version of the software forever but would need to pay for an upgrade.